When I woke up this morning, all I wanted was a cinnamon roll. 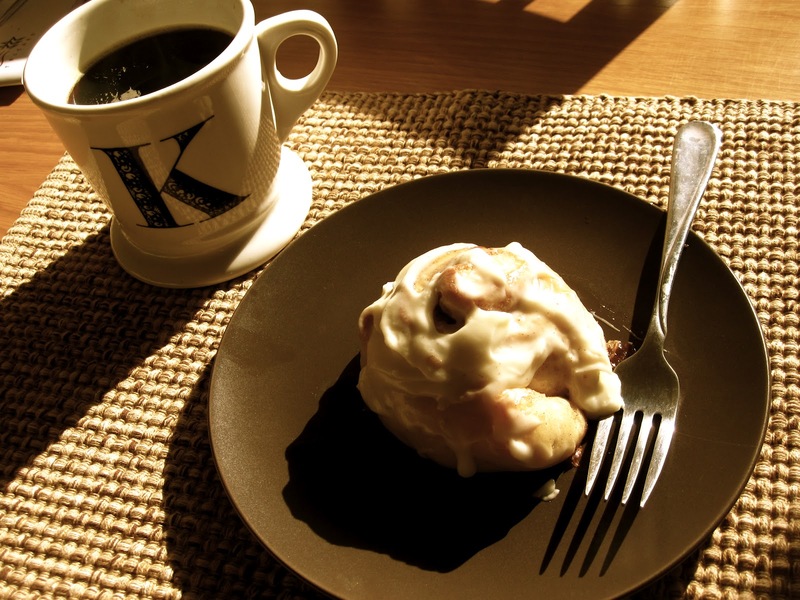 A hot, fluffy, lightly frosted cinnamon roll and a cup of coffee. It’s been rather warm here the last few days and I’ve been trying to avoid heating up our apartment with the oven, but this was a truly desperate situation. After finding, at last, a recipe that wasn’t going to take hours, I cranked the oven to 400 and began mixing up the dough. Halfway through the preparations, I realized I was short one egg. Knowing that the dough was only supposed to rise for fifteen minutes, I quickly hopped on my bike (because our car is in the shop) and rode to Trader Joe’s. I came out of the store five minutes later and my bike was gone. My locked bike. Stolen in broad daylight in front of a grocery store. I feel as though I’ve finally become a Los Angeles resident. I walked around the building a few times, just to make sure I wasn’t crazy and half hoping to see someone with my bike. Of course, I have no idea what I’d do in that situation. Yell “HEY- THAT’S MY BIKE!” and hope that the thief would feel sorry and offer to return it? Right. I half walked, half ran home, fearing that my cinnamon rolls would be doomed due to over rising. I prayed for the person who felt it was ok to steal my bike (now my last mode of transportation other than my own two feet) and tried my darndest not to be angry, though my confidence in the decency of people has been a bit tarnished. Long story short, we filed a police report and were able to sort things out with our insurance company in one painless phone call (how often does that happen? Thanks, USAA!). Given that we bought my bike used for about $100 and they base insurance claims on current market value, I will most certainly be able to get a decent new bike. 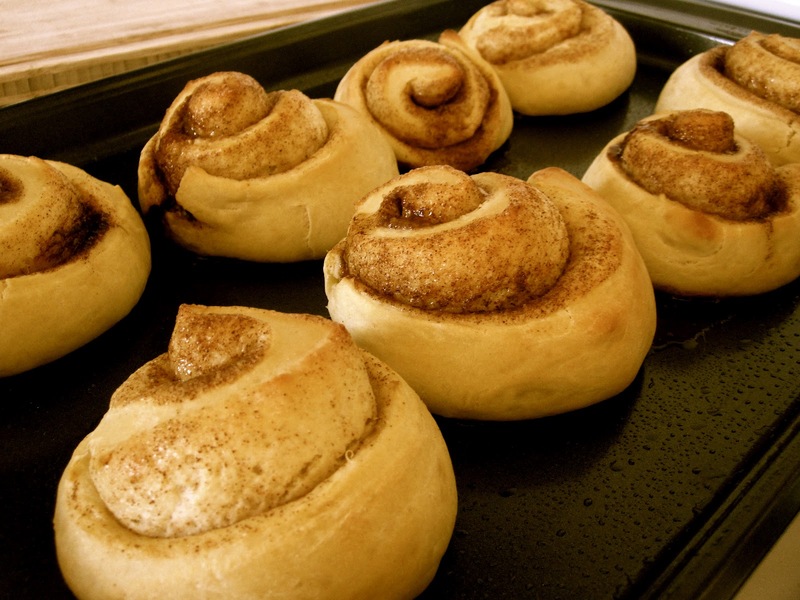 And, wonder of wonders, after all of this mess, the cinnamon rolls turned out! but the coffee and cinnamon roll were still good! In case you want to try them, here’s the recipe (adapted from Valley Ridge recipes at http://valleyridgerecipes.blogspot.com). Just make sure you have enough eggs before you mix the dough. I think I’ve learned my lesson. Mix everything together for 10 minutes and then let the mixture stand for ten minutes. Then roll the dough out into a rectangle (or a shape roughly similar to a rectangle) and drizzle with melted butter and cinnamon sugar (I used about 1/2 cup of sugar and 1 tablespoon of cinnamon). Carefully roll up and then divide into individual rolls. Bake at 400 F for 12-15 minutes. For frosting, mix 4 oz. cream cheese, 1/4 cup softened butter, 1 1/2 cups powdered sugar, 1 1/2 teaspoons milk and 1/2 teaspoon vanilla. Actually, you could probably cut this recipe in half and still have plenty, especially if, like me, you’re not a huge frosting fan.